Although the St. Johns Parade in Portland, Oregon, just celebrated its 50th year on Saturday, May 12, for the first time, the Portland-Peninsula Optimists participated in the parade! In planning our entry, Secretary George Galati suggested that we should ride a school bus as our entry since that is representative of kids. Mr. Galati, former principal of Roosevelt High School, was able to secure the donated use of a school bus and driver. The cheer team at the high school made signs for the sides of the bus. 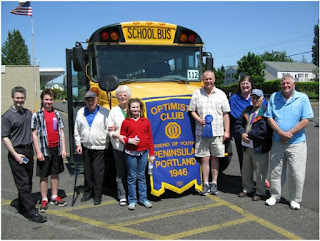 Many Optimists and kids rode the bus and waved to and kibitzed with the parade onlookers while traveling the parade route. Everyone had a great time, and it was a fun opportunity to let more people in the community become aware of our organization. To top it off, we won first place in the Service Division! Shown in the picture, left to right: Dave Trabucco (newly elected president), Dave’s son, Don Lee, Bev Lee, Dave’s daughter, Bill Van Nostran (immediate past president holding first place ribbon), Sharon Speer, George Galati (Secretary/Historian), and Wayne Henry.